How Many Ads Are Too Many Ads On A Website? There are few questions that galvanize online publishers quite like how many ads are too many ads to display on a website or webpage. Just about every quality publisher wants to find a balance of digital revenue and visitor trust/experience on their site. Ultimately, most that I speak with, err on the side of caution when making these ultimate determinations. Below, I’ll share hard data on this subject and outline everything digital publishers should know about determining how many ads should be displayed on a webpage. I’ll review all the data that exists on the subject and offer recommendations for balancing user experiences with online revenue. Assuming, you’re interested in the longevity and brand of your digital property, this is the right way to go. Advocating on behalf of your website visitors, when it comes to how their browsing experience is affected by ads, places you in a trusted position. This is how you can ensure that you don’t cannibalize longterm revenue or domain trust. Beyond visitor trust and experience, visitor behavior has a massive influence on digital revenue itself. Pageviews per visit, bounce rate, and time on site have a strong impact on the total revenue generated per session. This means that — brand and trust aside — visitor experiences are inexorably tied to digital ad earnings. This is a really common question I’m asked by publishers. What’s the right number of ads for a “insert topic vertical” site? I have the same response every time. You are thinking about the problem from the wrong perspective. Let’s think about it this way… A returning website visitor coming from Facebook to a specific article in the middle of the day on a desktop computer may have a totally different tolerance (or preference) for ads than a new user coming to the home page from Google search. 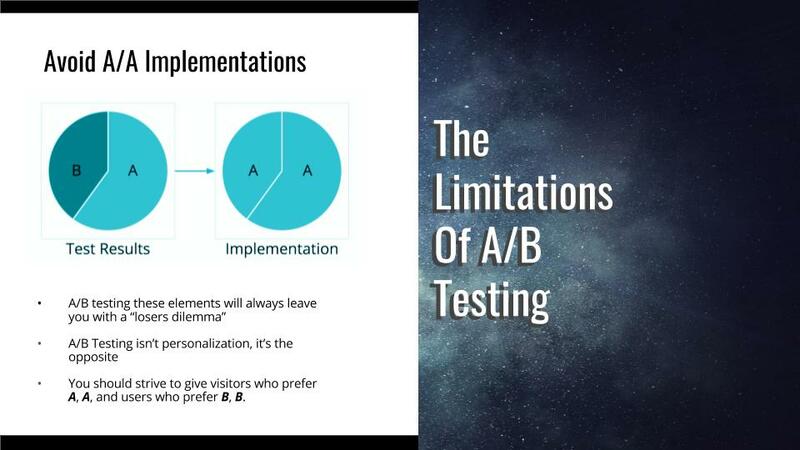 Understanding that your audience does not have a set preference for ad density is the first step in finding the right balance in this equation. Take a look at this recent case study we did. As you can see above, ads don’t seem to affect the bounce rate — as a whole — on this site until we reach approximately 7 ads. In fact, bounce rate actually goes down at about 5 ads, so we can assume those additional impressions aren’t badly affecting a users experience, right? Unfortunately, this excludes all visitors that come from organic search; which are dramatically impacted after 2 ad impressions. This means that, on average, 6 ads are the threshold for a consistent bounce rate, but for organic search visitors, the number is actually 2 ads. What’s more, when we start looking at specific articles, our data changes again. This time, bounce rate is largely unaffected until we reach 8 total ads. 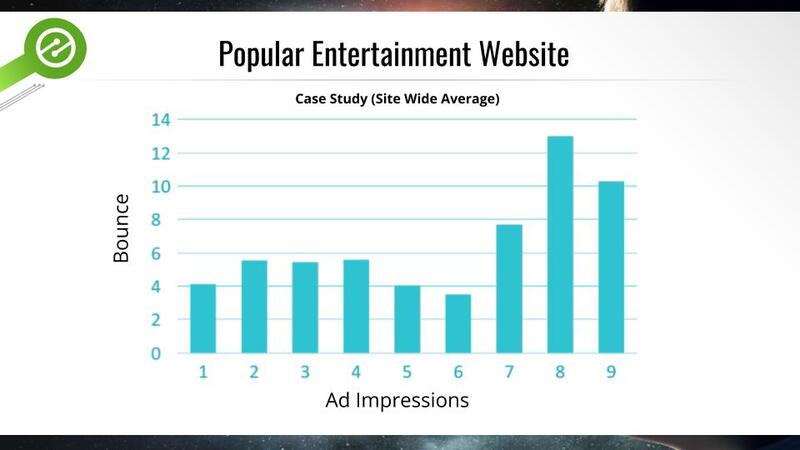 In fact, 1 ad impression and 7 ad impressions have largely the same bounce rate on this landing page (why it’s important to measure this by landing page here). Looking at bounce rate and pageviews per visit is one of the most objective (and industry proven ways) to ultimately determine how visitors feel about their experiences. It’s why we look at these metrics when conducting these types of studies. Visitors vote with their behavior every time they visit your site. So how many ads should that website in the study show on their pages? Let’s start by agreeing that just going off of the website average will likely be a non-optimal way to go (and will likely make some users angry). If we show everyone the same ad density, it is clear we will be annoying our organic search visitors on this website; forcing them to leave their session early. 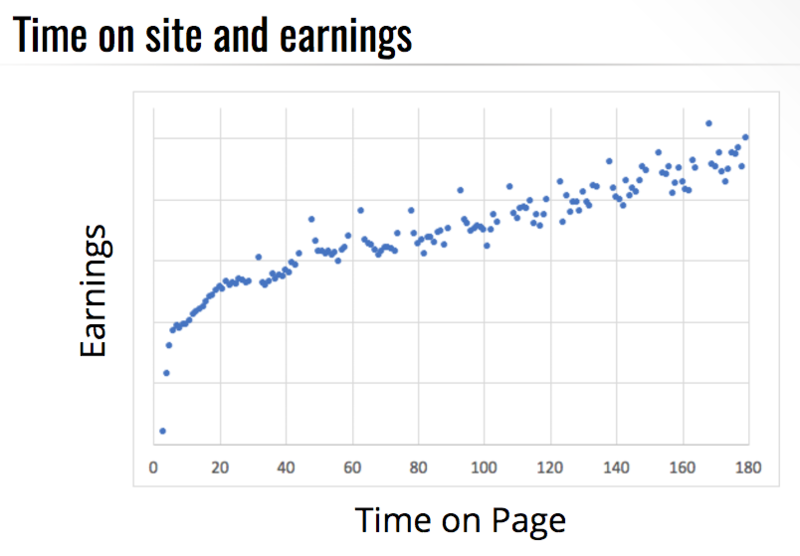 A good way to start thinking about determining the number of ads we show would be to start looking at landing pages to see how pageviews per visit and bounce rates changes by landing page. This way we could at least ensure that we were averaging ad impressions per page based on how visitors are affected on a page by page basis. This gets us a lot closer to providing better user experiences than by looking at site-wide averages; however, we still aren’t looking at our visitors differently, just our pages. After we figure out ads by page, we should start looking at different traffic segments to see how each one responds to a different number of ads. Unfortunately, the only way to get this part right is by changing the number of ads on a page based on the traffic source. This means running a few tests. There are a lot of free tools that will let you do this (obviously, if you’re an Ezoic user this is all being done automatically — Ezoic is testing and delivering all of this material using machine learning). 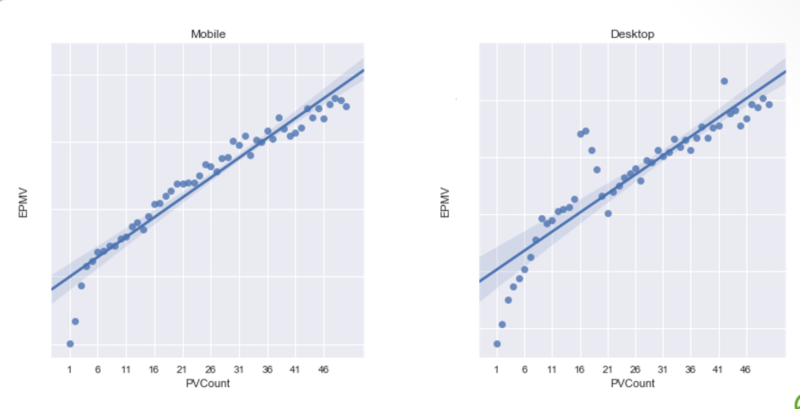 If you’re not using Ezoic to run these tests (and automatically delivering optimal density on a per-user basis), script your visitors based on traffic source and run a few experiments looking at how they are affected by different ad combinations. Once you have enough data (50,000 sessions is a good number), you should be able to see how different types of users respond. Now, you’ll want to ensure that you continue to deliver every visitor a different number of ads based on traffic source and landing page. One of the biggest mistakes publishers make (even the largest ones) is showing all visitors that the same number of ads — in the same locations — on every page. This means that the publisher is basically ignoring a large number of visitors that are, in the data, telling them that the ads are negatively impacting their experiences. For example, look at this data from a sports publisher above. They recently opted to change from having 8 ads on every page to 6. 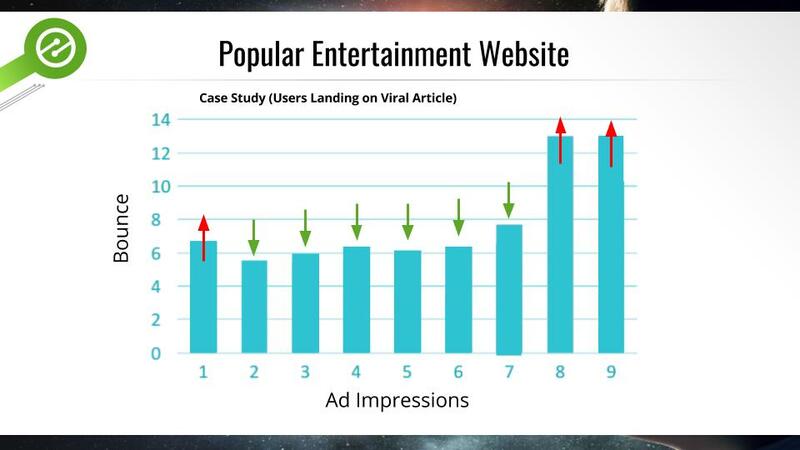 They subjectively believed that 6 ads were less intrusive than 8 and that users would prefer 6 to 8. To some degree they were right. 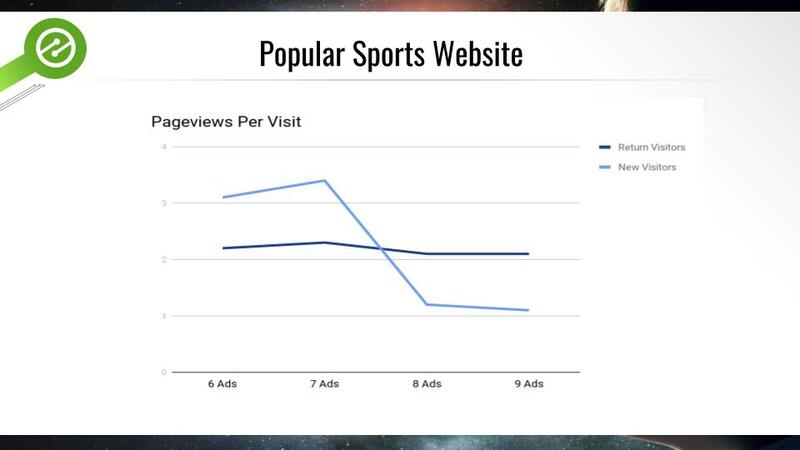 New visitors, on average, typically viewed more pages when 7 ads or fewer were shown. However, this had no effect on return visitors. 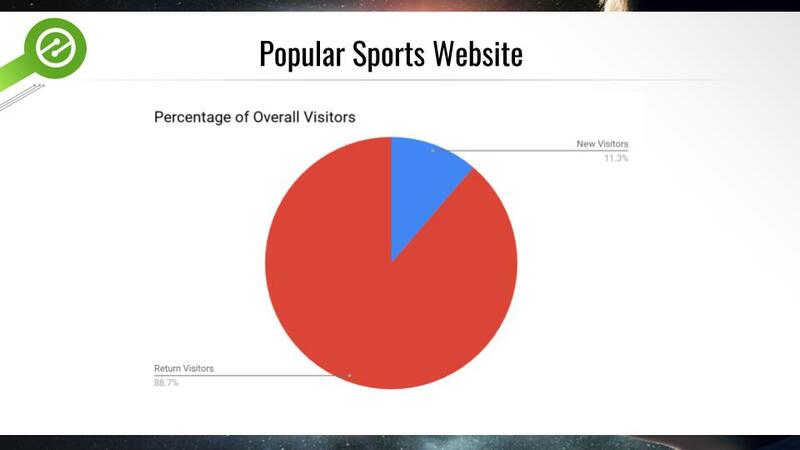 Unfortunately, the mass majority of visitors are return visitors. This means the change only positively impacted 11% of visitors and had no effect on 89% of the rest. This ultimately resulted in a 30% overall digital revenue decline. The decline was 100% driven by the decline in ad earnings from return visitors. On the plus side, total revenue from new visitors increased after the change was made. However, the trade-off didn’t make a lot of sense. The publisher ultimately sacrificed +30% of their revenue to please 11% of their visitors. A better solution in this scenario would have been to give the new visitors 6 ads and the return visitors the standard 8 ads. This would have allowed the publisher to satisfy the new visitors; while still achieving the monetary benefits of 8 ads with return visitors. If this would have been the publisher’s approach, they would have increased revenue by 12% instead of losing 30%. What is the best number of ads to show? Hopefully, at this point, you recognize the answer to this question is sort of relative. People always say, every website is different. But, that’s not true. Every visitor is different. Fortunately, it’s not a mystery. 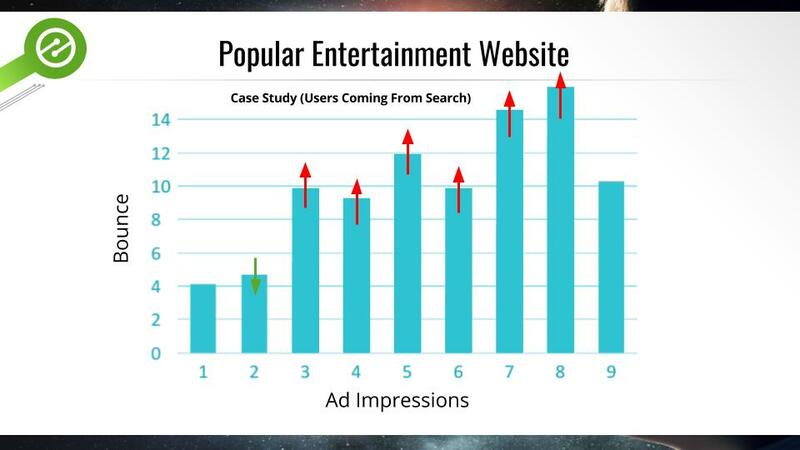 Any publisher on planet earth can segment up their traffic by visitor behavior (traffic source, new/return visitor, landing page, and more) and look at how ads affect each of these different segments. Understanding this data gives the publisher the ability to improve user experiences site-wide; while also maximizing the revenue they earn from ads. Obviously, if you’re an Ezoic user, this is sort of non-helpful. Ezoic automatically tests hundreds of visitor variables and automatically helps publishers adjust ad density, placement, and types based on every visitor’s attributes. The only additional advice that I would provide to Ezoic users would be to ensure that you have a lot of placeholder setup on your website. This ensures that you can test a number of different densities and ad locations. I see a lot of publishers concerned about ads only showing in “premium locations”. I can tell you that, from seeing tons of data from thousands of sites, there are no premium locations. Every visitor is different and prefers different treatment. I own a number of sites and have them littered with placeholders. I let my users decide. Additional questions or thoughts. Leave them below. I always monitor the comments and offer responses. Tyler is an award-winning digital marketer, SEO veteran, successful start-up founder, and well-known publishing industry speaker. Tyler also serves as the host of Pubtelligence, a publishers-only event hosted at Google offices around the globe. Tyler describes his core competency as learning. He has composed content for some of the world’s top publications and has over a decade of experience building businesses in the digital space. Tyler is currently the Head of Marketing at Ezoic and serves as an SEO and marketing expert for start-up competitions across the U.S.
Hi new Ezoic user and fan here. I understand the need for testing and for this more the no of placeholders the better. However, I have run out of ideas of where to put them in my site! With some difficulty, I managed to add the min you recommend -15 (including my existing Adsense code). My question is, how to decide which placeholders are different enough for testing. For example does to make sense to add one after each para or is it good enough to add one at 25%., 50%, 75% and 100% of the article length. That is how to determine positions that will help meaningful testing? In general, the more placeholders implemented, the better. This provides more testing options for machines to test and measure. That’s why our support team recommends a minimum of 15 placeholders (this does not mean 15 ads will show), just that at least 15 locations are available for testing on different types of visitors. Under each paragraph would be optimal; as long as the sizes and placements are set correctly. This will ensure the system can try a really wide array of options to visitors. If you already have them at 25%, 50%, etc. this is good. However, it may benefit you to have them under each paragraph if you are looking for ways of improving results even further. Many thanks. I will do that. Ezoic is a Google Certified Publishing Partner with that helped me with this. Thanks guys! Hi Tyler. Great piece and examples. I have a question I’ve had trouble tracking down an answer/data about. Do you know how effective it is to have basically one static ad-perhaps in a couple sizes with banners and a side ad-on a single product that appears on each page vs. varied ads? Do readers tune out ads if they’re just the same? Thanks! We have some research that suggests blocks of ads all in one location (i.e. several ads bunched together in the sidebar) are often neglected by readers (low engagement); as it is sort of signaling to users, HERE ARE THE ADS. This leads to more banner-blindness than normal. As for multiple ads on a page being filled by the same advertisers, it is not really a problem to be overly concerned about. This is actually a common occurrence for publishers to see, but really rare for visitors. No research suggests this leads to any kind of negative experience. Publishers will often see this more often than real visitors because the publisher is often visiting their site more often than a normal visitor. Advertisers see that data and lower their bids or drop out of auctions for that visitor; leaving only maybe one or two advertisers filling that space. Thanks for sharing this nice, helpful and informative article. Thanks. Happy Blogging. Hello, its nice article about media print, we all be familkiar with media is a impressive source of information.